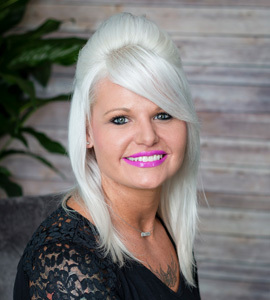 Heather has been with S-kape since day one, first as support staff, then obtained her nail tech license, and then went on to achieve her esthetician license. Heather spends most of her time pampering her loyal guests with spa pedicures, gel manicures, body waxing services, and airbrush tanning. Heather is in high demand for services and we attribute this to her bubbly, warm personality and exceptional guest service “I absolutely love giving my guests the opportunity to unwind and lending an ear to those who need someone to listen.” When heather is not at the salon she enjoys house projects, bargain shopping and spending time with her family. Heather serves guests on Tuesdays 9:30-3:30, Wednesdays 3-9, Thursdays 3-9, Fridays 9:30-3:30 and Saturdays 9-4.